The morning started with taking the mountainbike out for a small tour. Normally it is just the bike and me, but now decided to bring my trusty camera along. With the D810 + 16-35, some water & food off we went! Why I bring a dslr along? I don't know really... Might see something cool, otherwise keep it in the backpack for extra weight! Enough of the sporty stuff... lets talk aviation! It's been a while since I have been at Schiphol Airport this year. No excuses today, dust the gear off and full throttle (what the maximum speed limit allows) to EHAM. Start off at our beloved spotted called Romeo to get the fluids going. After our good call to visit Romeo... ahum... The next destination was Schiphol Oost, home of the business jets. Passing the McDonalds (09-27) the shape of DC-3 was becoming more clearer. Okay... this could turn out nice with the approaching sunset. Park the car, walk the walk and see if it could line up just right. Judging you noticed the picture above, it did! 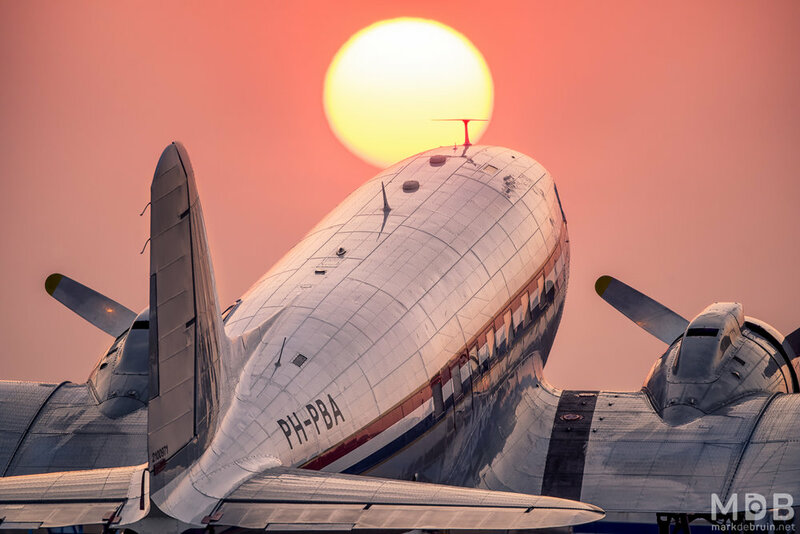 The Douglas DC-3 Dakota from DDA Classic Airlines showed her rivets and lines. Be sure to check out Schiphol Oost on a sunny evening, it might just save your 'blue sky' day! And thanks Marco for the frikandel! You are a legend!